Simply choose one of the options below to show your support. All donations are 100% tax deductible as allowed and most importantly will help so many veterans in ways you can not even imagine. With your donation of $10 and up you will receive a Dog Tag with your name imprinted on them. Help us support our growing movement! 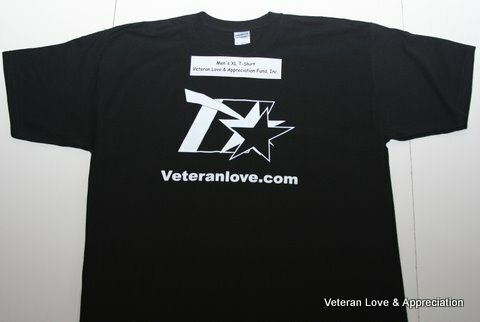 A donation of $25 or more will get you a Veteran Love T-shirt which you can proudly wear in support of our organization. sample of the T-shirt you will receive. Only the logo and website will appear on actual shirt. Make payments with PayPal - it's fast, free and secure! Click the PayPal logo below to make your donation via your preferred credit card and help veterans in need of assistance. If you have questions please call or email us and we will assist you. The Hero Miles program, through a partnership with many of the major US airlines and the Fisher House Foundation, has provided close to 4,000 flights, reuniting families of our wounded heroes.